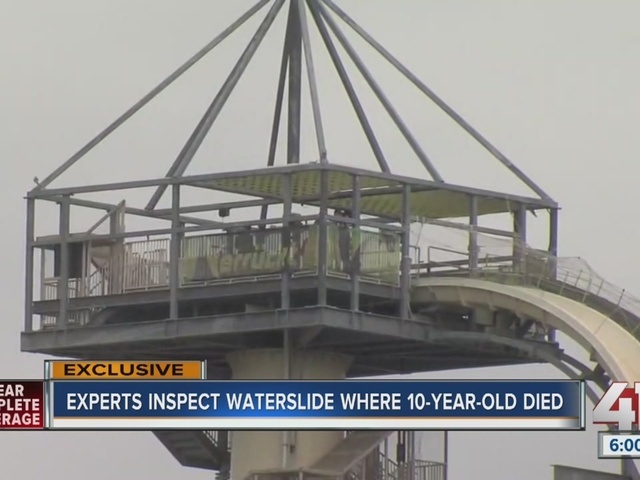 Days after Schlitterbahn water park closed for the season, a team of independent investigators examined the park's Verruckt water slide. One month ago, 10-year-old Caleb Schwab died after riding the Verruckt. According to a police report, Caleb died of a neck injury. Two women riding in the raft with Caleb were also injured. 41 Action News watched as a team of experts for the Schwab family and the two female passengers inspected the now-closed, rusted slide. Hours later, the team left the park to examine the raft still in police custody. In cases where an individual has died or is badly hurt, independent investigations are often conducted. "We always do a lot of investigation on our cases. One like the Schlitterbahn case, that's highly technical and there's lots of engineering stuff involved. You absolutely have to have an expert," said Matt Meyerkord. Meyerkord is a personal injury attorney in Kansas City. He's not involved with the Schlitterbahn investigation but agreed to sit down with 41 Action News and explain what investigators might be looking for. "It's a fairly thorough investigation. You test every part of it and look at every inch of what you're investigating," said Meyerkord. Documents obtained by 41 Action News reveal the calls for service to the park in the minutes following Caleb's death. According to the documents, the first call came into the Kansas City, Kansas Emergency Dispatch Center at 2:34 p.m.
"A caller stated looked like someone had been [hurt] at the park," the document read. At 8:02 p.m., the "incident [was] terminated." 41 Action News also discovered the fire department responded to "sparks coming from the top of the Verruckt slide" a month before Caleb's death. Schlitterbahn said workers were welding the top of the slide, performing maintenance on the converter belt. It is still unknown if the public will ever find out what went wrong. Meyerkord said he has seen most cases settle before going to court. However, in Kansas, there is a limit on personal injury and wrongful death cases. In personal injury cases the limit, for non-economical damages, is $300,000. In wrongful death cases the limit is $250,000. It is still unknown if lawyers representing the Schwab family or the women injured in a raft with Caleb will file a lawsuit or settle. Schlitterbahn is a Texas-based company so the lawyers involved could move forward with legal proceedings there.